Velociraptor, nicknamed “Raptor”, has been given a wealth of publicity through the movie Jurassic Park 1-3 1. But, most of what we know about Velociraptor on Jurassic Park 1-3 is false and based on faulty assumptions. Like most theropods, besides T. Rex of course, Velociraptor had a slim head that followed a long semi-oval of sharp teeth. These teeth were perfect for staying onto fighting prey and with the combined force of the leg and arm claws, this dinosaur was be a formidable foe for his fellow dinosaurs. This head also had a huge brain cavity which has allowed Velociraptor to get a name for being extremely smart. Although we can’t be sure, it does seem very possible that Velociraptor was smart, but not near as smart as many movies give him credit. One of the most popular part of Velociraptor would be its feet. The foot of a Velociraptor had four toes. No one knows that the use of the first toe was but the rest of the toes play an important part of Velociraptor structure. Nice fruit slicer, don’t you think? The third and fourth toe held the weight of the Velociraptor while the other was raised at a nearly 90 degree angle. Many paleontologists believe that Velociraptor kept this toe raised as it ran, that way it could keep it sharp and ready in case it needed to use it. Although this amazing toe and claw is usually used as evidence for a carnivore, there are other solutions to the use of this tool. Since we know that Velociraptor did not eat meat when he was first created, we can be sure then that he did not use his claw, at least before the fall, for killing purposes. Instead, his claw would have been perfect for slicing open fruit that had a hard shell, like a watermelon. Imagine a huge, juicy watermelon (is your mouth watering?) laying on the ground. Velociraptor is hungry so he uses his amazing claw to slice open a nice, deep and thick line for his mouth. He wiggles his mouth in and enjoys the delicacy! 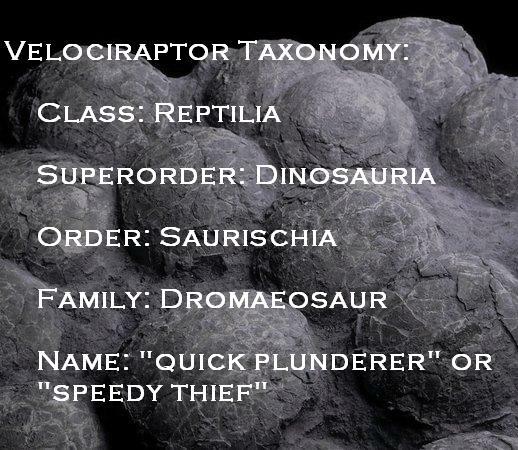 Velociraptor had a body built for speed, in fact, his name even tells you that! With lightweight bones and a very strong tail he could probably run fast and quickly take over its prey. It legs were quite long for his overall size and they were powerful enough to keep the “quick plunderer” busy. A baby Velociraptor skull was once found with a peculiar problem with it. Two small holes poked through the skull and the search for what fit in those holes was in task. When a Velociraptor adult’s teeth were inserted in the holes they fit. With this new skull paleontologists are now considering that Velociraptor may have been a cannibal; eating fellow Velociraptor’s babies. We may never know for sure but it is just another reminder of the sinful, death-stricken world the dinosaurs and we live in! The Velociraptor will always be famous but why not direct that publicity back to God? That is the purpose of this outreach and what we should be doing; turning the world back to God, through Christ Jesus, our Savior and Creator. 1 Refer to my page, Jurassic Park 1-3. 4 I am not saying that all of this list is necessarily true but the evidence does suggest that what the list states.